I am a brunch addict. Whether it's sampling the many brunch spots Edinburgh has to offer or cooking up a storm at home, my brunch game is on. This is a fairly new obsession that has become a bit of a Sunday ritual. I feel like there is no better way to start a productive day and catch up with friends. I can recommend some gorgeous places in Edinburgh to eat breakfast and brunch such as Montpellier's in Bruntsfield, a beautiful and stylish cafe with a huge menu with every brunch option you could ever want. The Pantry in Stockbridge or Leo and Ted in Bruntsfield are the absoloute best for some eggs and coffee. For something a bit healthier check out Hula Juice Bar at the Grassmarket or the amazing Grams at Haymarket. Now, nearer the end of the month when I need to cut back a bit, eating out all the time and brunching tragically the first thing to go. So, to satisfy my brunch cravings I like to invite some friends round and show off my cooking skills with a homemade but simple brunch. 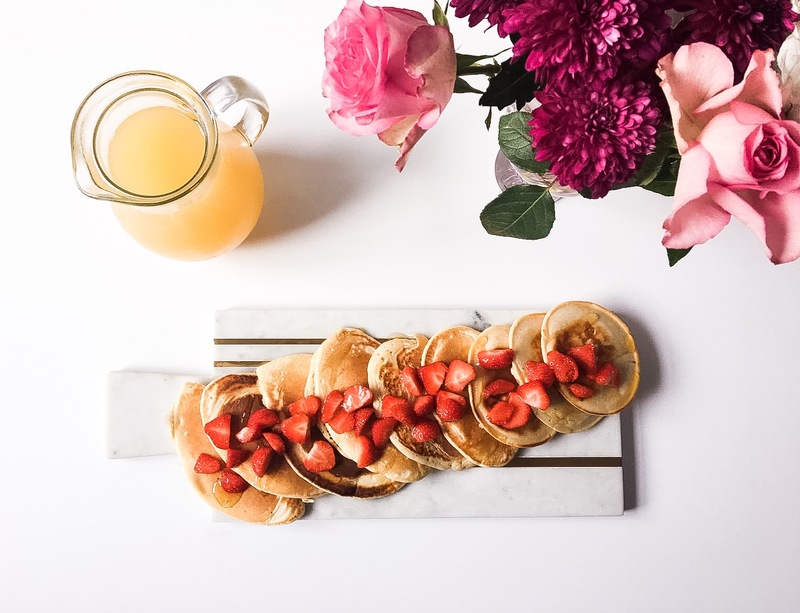 My favourite offering of the moment is American Pancakes with Strawberries and a drizzle of honey. As fas as method goes, I just throw all of the ingredients into my NutriBullet blast it until smooth. Then heat my frying pan to a medium heat, add a little butter and pour the batter in, it will look fairly thick but that is the way they should look to begin with. Flip & repeat, then serve up with a drizzle of honey and some fruit. 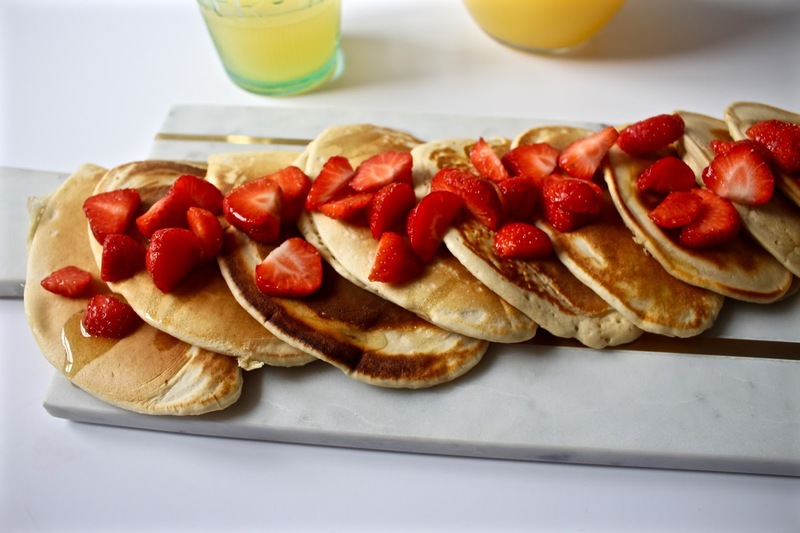 You can add whichever fruit you want to this recipe or serve with eggs, bacon and syrup like a traditional American breakfast. Another amazing pancake combination is nutella and banana which is great if you are looking to treat yourself. You still have your instagram-able brunch whilst saving rather than spending. Oh this made me so hungry. I love pancakes and everything like it! Do you have a vegan option too? I could replace the milk with 'havredrick' maybe. Do you know this? The photo's look very tasty! I am also totally obsessed with brunch but its avocados for me - although these do look incredible!! Oh wow! The food looks amazing. You've made me hungry, I need a snack. Your photographs are always so beautiful. 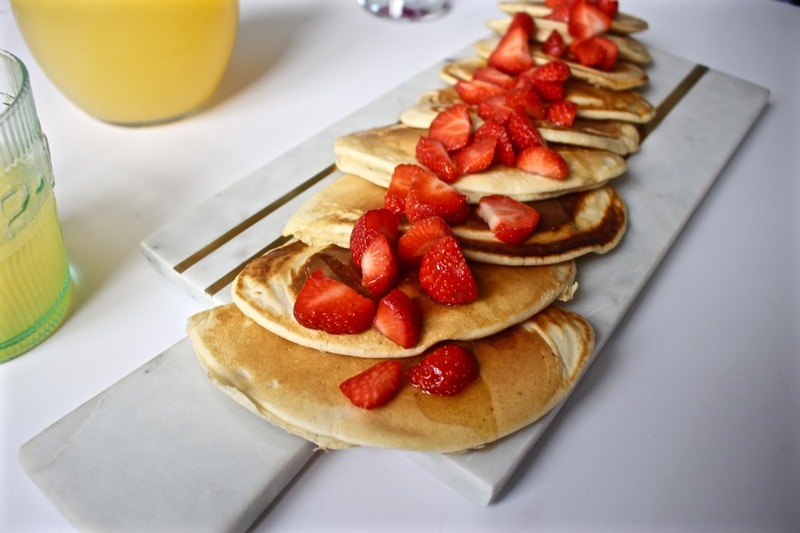 Pancakes and strawberries, cant go wrong with that and I'm sure your friends were very happy. Lots of love from London. I LOVE brunch! I don't do fancy brunches now that I'm a mum but I used to host them for slightly hungover friends on Sundays. Love the photographs! Oh this looks so good! Really makes me hungry. Looks like a tasty meal, I love pancakes! Awww such lovely food! Thankfully I've eaten :) Brunch is my favourite way to catch up with friends, since breakfast has always been my favourite meal of the day! That looks like a delish brunch! I love brunch too and this looks really tasty. Those pancakes look absolutely delicious, I'm definitely a brunch addict too but I'm more of an avocado and sour dough kinda girl. Haha I love the title of this post, I haven't had brunch in ages! I LOVE brunch!!! and pancakes!! How gorgeous are your photos!!! What a lovely idea for brunch it looks delicious. I really do love pancakes. Wow!! Such an amazing website! Thanks for that inspiration - great photos!